Click here to go to page 1 of the walking holidays in Kenya. After breakfast we drive to the nearby Solio Ranch. This time we do an extensive game drive in the Rhino sanctuary, which has the world's largest concentration of Black Rhinos. The White Rhino is also found here as well as the Reticulated Giraffe, Leopard, Lion and a wide range of plains game and bird life. We will drive around in the ranch but since this private sanctuary is little visited by the main tour operators, we will not have many cars surrounding us. Transfer to the Aberdare Country Club for lunch. A highlight in our hiking vacations is the Tree Hotel in the Aberdare National Park, where elephants, Buffaloes, Rhinos and other game come to a floodlit waterhole right below the balcony of the hotel. Our hotel of choice is The Ark, which is designed for game viewing from various decks. The game viewing is an all-night show and many visitors pass the night time focused on the waterhole where among the species frequenting are elephants, black rhinos, hyenas, various gazelles, warthogs, giant forest hogs, the elusive bongo and with luck a leopard or a lion may pay a visit. A 4 hour bus transfer takes us to the Rift Valley, where we will stay for 3 nights in the Lake Naivasha Country Club which borders the lake or in the smaller Naivasha Kongoni Lodge built on a cliff overlooking Lake Oloidien. In the afternoon we do a game viewing hike at the privately owned Crescent Island, which is a peninsula on the Eastern shore of Lake Naivasha. There is a lot of easy to see game e.g. Masai giraffes, wildebeests, waterbucks, elands, zebras and impalas. It is also a heaven for birds with +200 Kenya birds species recorded. The walk is gentle and satisfying. We return to the lodge in time for afternoon tea. We wake up for breakfast with the sun giving a wonderful effect over the lake. An early morning here should not be missed by nature travelers with an eye for birds since the lake boasts a wide variety of water and woodland birds. After breakfast we do a short transfer to the Hell's Gate National Park. This is a unique park where walking with good sightings of giraffes, zebras, warthogs and many types of gazelles are found here. The first part of this walk is done in typical flat African savanna in a volcanic area with huge rock boundaries. There are camphor and acacia trees all over and this is where to look for the giraffe as they mainly feed on them. A picnic lunch provided by the hotel will be at a view point on the Hell's Gate gorge. The last part of the guided walk is done by descending into the Ol Njorowa Gorge which has running water from geysers and wild vegetation. The climax of the day is in walking in the side gorge where the rocks have split to leave only a walking path. We climb back to the Ranger's Post for transfer back to the lodge of our choice. An early rising will ensure that one gets another magical display of the various Kenyan birds. After breakfast we do a transfer by bus to the nearby Crater Lake Game Sanctuary. It is a lesser lake in the Rift Valley but a place where nature is at its best. We will do a walk in the sanctuary followed by a circular trek on the crater rim from where we see the lake from various angles. On the walk look out for giraffes, black and white Colobus monkeys, elands and a range of gazelles. With a bit of luch we might even see some jackals, bat-eared foxes and hartebeests. After an early morning boat ride on Lake Naivasha on the look out for hippos, the game on Crescent Island (now seen from the lake) and loads of water birds, we head towards the Kiambethu Tea Farm, where we'll be in time for lunch. This is an old colonial home established by the early settlers and the pioneers of tea growing in Kenya. There will be a talk on tea: its arrival in Kenya, the growing, processing and up to when you put it into your cup. A short guided walk in the tea plantation and into a small remaining part of indigenous forest completes the tour. We have a healthy farm lunch and thereafter transfer to Nairobi for the evening flight out ending a successful Kenya hiking adventure vacation. PRICE: Our attractive price based on the size of your party includes all accommodation as per itinerary, all meals from breakfast of day 2 through lunch of day 8, all transport Nairobi-Nairobi and airport transfers, bottled water during the walks, services of guides, the park entrance fees and a Flying Doctors Evacuation cover. The only extras on you are your airfare to Kenya, visa, travel insurance, drinks at the table, tips and expenditure of personal nature. 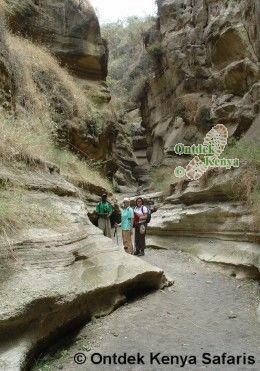 For a consultation on Africa walking holidays, contact Ontdek Kenya safaris, we have over 20 years of experience in organizing walking safaris in Kenya.